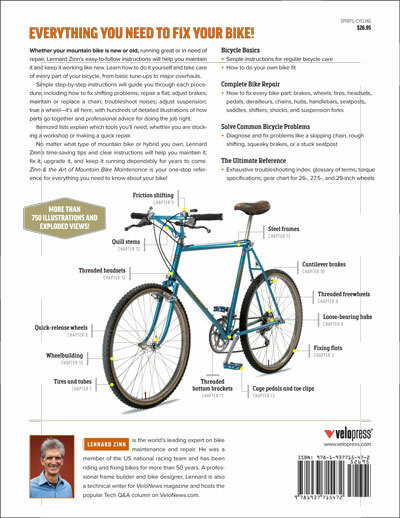 Lennard Zinn is the world’s leading expert on bike maintenance and repair. His friendly, step-by-step guide explains the tools and parts you’ll need and how to know you’ve done the job right. The book’s two-color interior is easy to read—even in a dimly-lit garage or workshop. More than 750 hand-drawn illustrations and exploded-parts diagrams show just the right level of detail to lead you through every mountain bike repair task. 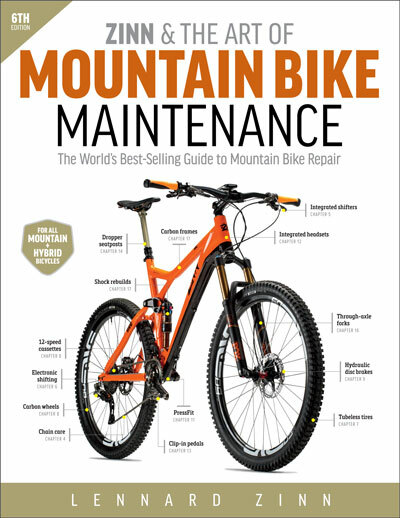 What’s New in Zinn & the Art of Mountain Bike Maintenance, 6th Ed. New chapter on electronic shifting covers maintenance, service, repair, and troubleshooting of all Shimano electronic shifting groups. Also included: How to program your electronic shifting system for personalized shifting as well as real-time display and shift recording on a head unit. New chapter on disc brakes covers maintenance, service, and repair of all hydraulic and mechanical systems. Includes integrated systems and their bleeding requirements. New guides on how disc brake mounting adapters work and how to install them. Complete info on the new 11-speed and SRAM 12-speed drivetrains. Info on all the newest bottom brackets including 1×11 and 1×12 systems. New guidelines on wheel size selection for your frame size, suspension settings, and travel. New procedures for mounting and sealing tubeless tire systems. New usage guidelines for flat-prevention sealants. Updated guides on replacing press-in bottom brackets with thread-in bottom brackets. New wheel lacing guidelines for building disc-brake compatible wheels. More than 750 comprehensive illustrations and exploded views including 150 new or revised illustrations. Updated and expanded guides on how to tune, rebuild, and maintain suspension forks and rear shocks. Includes tuning guides for preload, compression, rebound, and sag. Updated and revised troubleshooting tables, torque tables, and gearing charts for 26”, 27.5”, and 29” bikes. Also covered in the 6th edition: All derailleur shifting systems; all bottom bracket systems; all brake systems; all headset, stem, handlebar and fork systems; wheelbuilding for all bikes; updated and expanded torque tables; complete indexes of all illustrations and topics covered.